Ospreys flanker Justin Tipuric is out of Wales' tour of New Zealand in June. The 26-year-old open-side has been advised to take a three-month rest after suffering concussion playing for Wales against Italy on 19 March. "Justin is recovering well," said medic Chris Towers. "But in the light of his symptoms the advice is it is in his best interests to take time returning." Wales play three Tests against the All Blacks on 11, 18 and 25 June as well as a midweek match against Waikato Chiefs. A statement added: "A prolonged three-month period of recovery rules him out of the rest of the season for the Ospreys and the Wales tour to New Zealand. "The focus for Justin will be on getting healthy and fit, ready for pre-season." International prop Paul James is also out for the season following eye surgery, while the Ospreys confirmed centre JJ Englebrecht and prop Ma'afu Fia will also not play again this term. The 43-times capped Tipuric started for Wales in three of their 2016 Six Nations internationals, taking the place of the injured Sam Warburton against Italy in Cardiff. 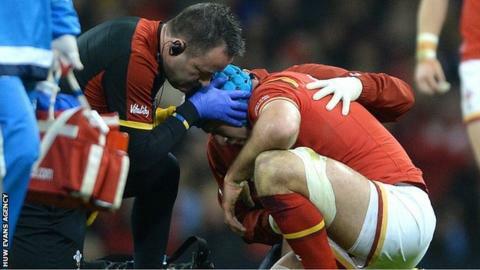 But he departed after 16 minutes after falling heavily at a line-out. The Swansea-based region hinted on 30 March that the 2013 British and Irish Lion tourist's season could be over. Backs coach Gruff Rees said then: "We're not putting any pressure on him having to do anything but sitting on the sofa." Tipuric's ball-playing skills had also led to his name being linked with a possible call-up to the GB sevens squad for the Rio Olympics, which would also be ruled out by his enforced lay-off.